For your own safety and comfort and that of your stock, I highly recommend that you train your horses or mules to horse hobbles before going into the backcountry. 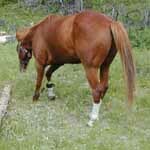 Below I have outlined a very basic procedure that should quickly and easily accustom your horses and mules to hobbles. Regardless of whether you will be using two- or three-leg hobbles or picketing your stock, the first step will be essentially the same. For two-leg hobbles, I recommend waiting a couple hours past normal feeding time and then putting your stock in a corral or round pen with a flake of hay. While they are eating, attach the hobbles to the front legs and give them a tug so that your horse or mule knows he is restrained. Because horses tend to think more about their stomachs, the initial hobbling experience will be a little less traumatic than a first time attempt in the backcountry. You can spread the hay out so that your stock has to walk around and realize that he is restrained. This process should be repeated to ensure your stock is comfortable with being hobbled before taking a pack trip. For a picket hobble, once again wait a couple hours past feeding time and put your stock in a corral with a flake of hay. Attach the picket (single leg) hobble to a front leg and the picket rope to the hobble. Allow him to drag the picket rope without the picket pin attached until he is use to it. When you stake him out on grass or hay for the first time, take him out to the end of the rope and let him know he is restrained. Be sure to drive the pin straight into the ground. Your stock could pull out a pin driven in at an angle. If you horse is hungry, he should be too preoccupied with eating to have a bad first experience. This process should be repeated to ensure your stock is comfortable with picketing before taking a pack trip. If your animal has figured out how to crow-hop his way down the trail in two-leg hobbles, you may try using three-leg hobbles to keep him restrained. Even if he is used to two-leg hobbles, I highly recommend the same procedure as described above for introducing him to three-leg hobbles. Some animals may react poorly to having a back leg restrained and it would be best to find that out at home in your round pen rather than 20 miles from the trailhead. In addition to grazing your stock in camp, hobbles are useful if you need to or choose to stop somewhere for a break where there isn't a place to tie up your animal. Many riders keep a set right on their saddle for just these situations. 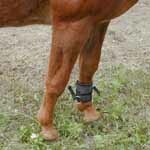 A handy tip: I prefer neoprene two-leg hobbles when I graze my stock. After they finish grazing in the evening, I take one hobble off of one leg and buckle it above its mate on the other leg. This saves me time when I turn them out in the morning and I don't misplace the hobbles. This trick works well with neoprene hobbles, but may not work well with heavier and bulkier leather hobbles.